In the winter, I’d like to think of myself as a major tea connoisseur. Summer, on the other hand, is a different story. There’s just something about bundling up in the cold, rainy weather (PNW problems 7 months out of the year) with a warm, yummy cup of herbal tea. It’s soothing. It’s relaxing. And honestly, it’s one of my favorite parts of the day. How we’ve already made it through January, I have no clue, but it’s official. I’ve successfully completed 3 Teas, 3 Weeks with a variety of Traditional Medicinals herbal teas and I’m legitimately HOOKED. It was an easy decision to participate in this 3-week experience as I’ve been a longtime fan of and have used Traditional Medicinals teas for years. 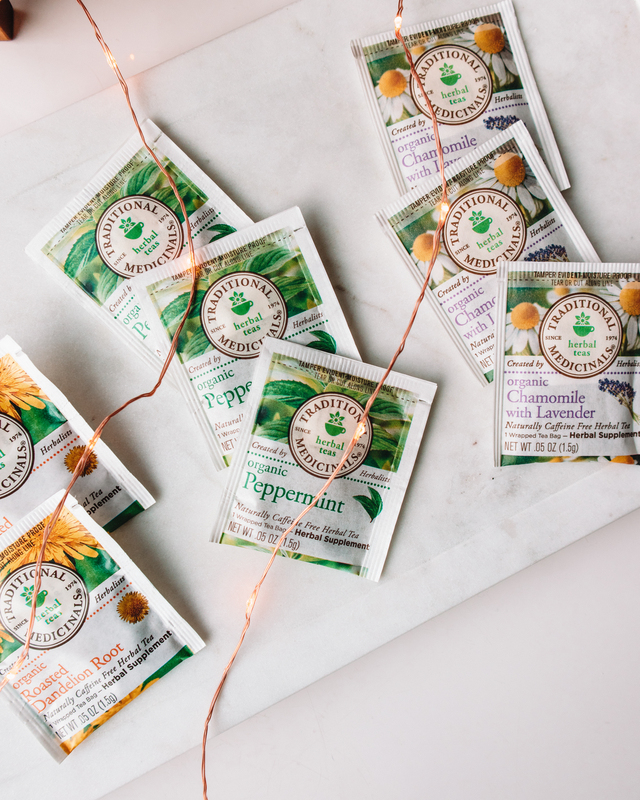 Their products have always stood out to me—they seek out organically farmed or organically wild-collected herbs, there are so many to choose from (!! 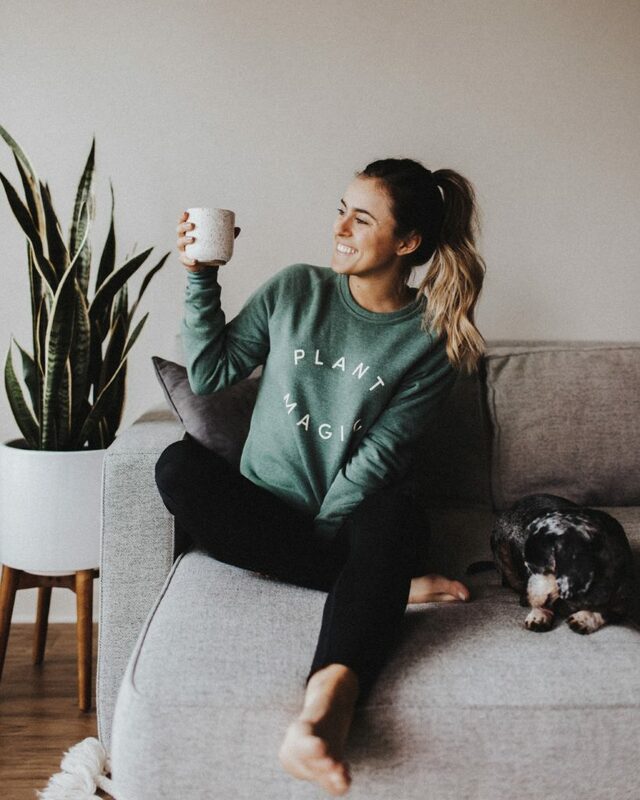 ), and it’s such a great way to elevate your wellness routine by incorporating more plant-powered teas. 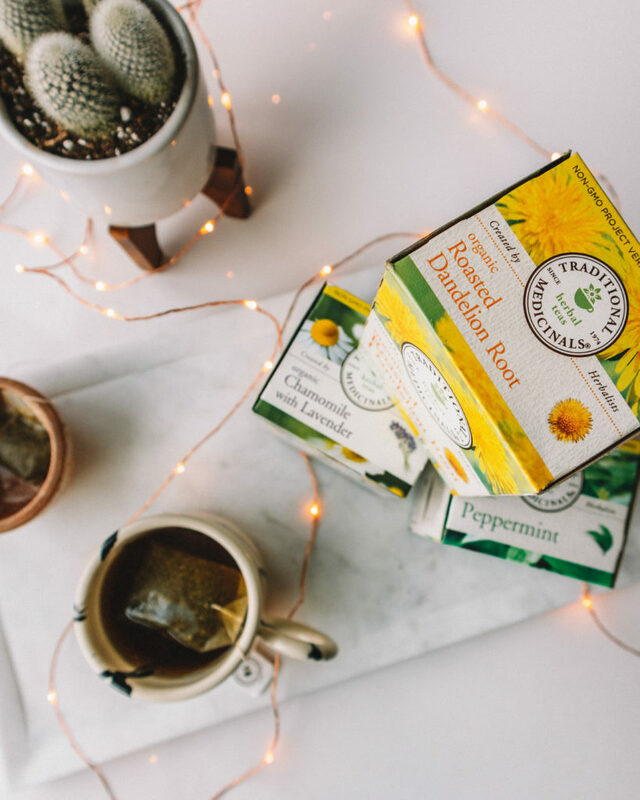 Since their standards are so high when it comes to their tea, only a small fraction of the world’s herb supply is fit to be used in their teas. The premise of 3 Teas 3 Weeks is simple. Choose and incorporate three Traditional Medicinals teas into your daily routine for three weeks. I selected Roasted Dandelion Root, Peppermint and Chamomile with Lavender. I’ll explain a little bit more about each of them below. Roasted Dandelion Root is known for stimulating the liver and supporting healthy digestion. * It helps your body’s natural detoxification process…aka it works with your body, not against it. The tea tastes mildly bitter, similar to the bitter taste of a cup of coffee, so it’s perfect to steep in the morning. I got used to the taste within the first few days and really enjoyed it. 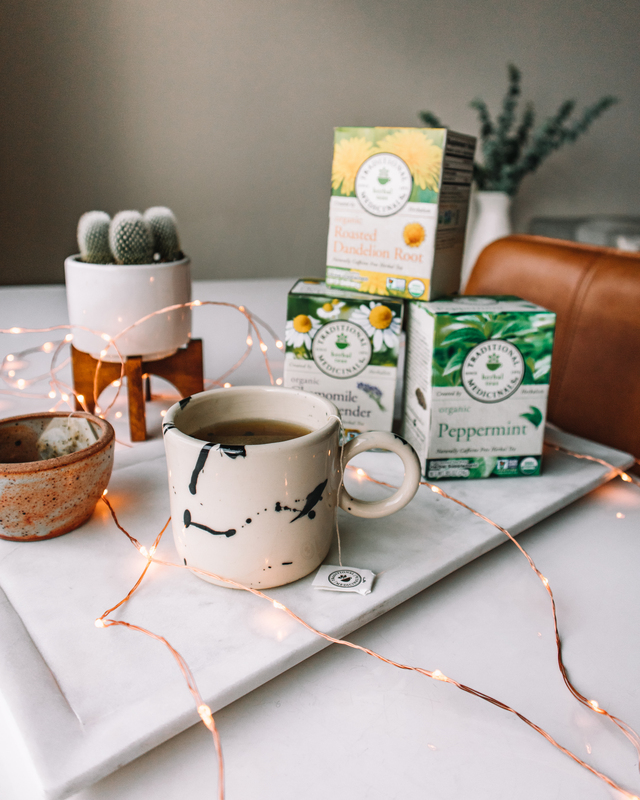 The Peppermint tea works wonders on digestion*—perfect for after a meal or to help relieve bloat. It contains organic peppermint, which is rich in essential oils, giving it that intense minty flavor. If you’re even the slightest bit into mint, you’ll be in peppermint heaven! Super cool and refreshing. I also love drinking it after a meal or in between meals. Fun fact: Traditional Medicinals actually sources their peppermint from Washington State’s Trout Lake Farm. This tea is perfect to have after dinner & before bed. It really helped me unwind and relax after a long day. The chamomile and lavender settle your nervous system, as well as relax the digestive system. * Super soothing and the taste is lavender with hints of floral. I think this was my favorite addition to my health regimen. The biggest lesson I took away from 3 Teas, 3 Weeks was making sure to take time and slow down. Having a routine really works for me throughout the day, especially since I work from home. So, when I set reminders for myself to make tea, it allowed me to stop and take a break from whatever I was doing / take a breather from work. Overall, I loved incorporating these teas into my existing daily wellness rituals. If you want to participate like I did, head to Traditional Medicinals to buy two, get one free! Just choose the teas that fit your particular needs + lifestyle. If not their website, I typically buy my favorites at Whole Foods.